Small amounts of antifreeze (ethylene glycol) can be lethal to pets, especially to cats and dogs. Ethylene glycol’s sweet flavor attracts animals, but once in the intestine it breaks down into hazardous chemicals which cause kidney damage and eventually failure. ChemSee-Foods’ Antifreeze Detectors allow the user to rapidly check if a suspicious sample of food or drink contains ethylene glycol (the hazardous component of antifreeze). 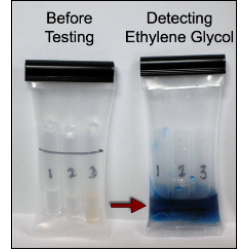 If ethylene glycol is present in the sample, a dark blue color will form within the detection vessel. Less than five grams of sample are required for testing. ChemSee-Foods’ Antifreeze Detector rapidly detects ethylene glycol (antifreeze) in water. If antifreeze is present in the sample, a dark green/blue color will form in the detection vial. Testing for antifreeze (ethylene glycol) in water is quick and easy. Simply add your sample to the fill line, break the three ampules in order and wait 30 seconds in-between each break. After the third ampule, wait up to 3 minutes for color to form. If a dark blue color forms in the pouch there is ethylene glycol / anti-freeze present in the sample. The DT-AF Antifreeze detector can also be used to check if Ethylene Glycol was placed in foods. Foods can be checked by mixing them with an equal portion of water and by using the water portion of the sample to test with.